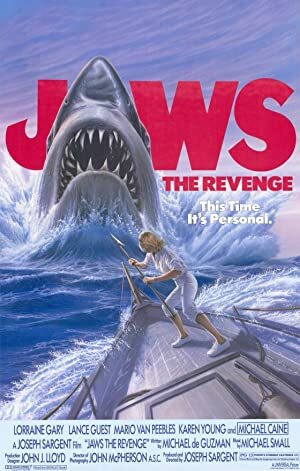 Jaws: The Revenge (1987) – What's New on Netflix Canada Today! After the encounter with the shark at Sea World, Sean Brody has returned to Amity. Here he has assumed his father’s role, working for the police department, and is engaged to a young woman named Tiffany. His mother, Ellen, still lives in Amity as well. Mike Brody is now married to Carla and is researching conch snails with his partner, Jake, in the Bahamas. One night, while repairing a buoy in Amity harbor from the police boat, Sean is ambushed from below and killed by the Brodys’ old enemy – a Great White Shark. After the funeral Ellen wants Mike to stay off the water, but he refuses and takes Ellen back to the Caribbean with him and his wife & daughter, Thea. Ellen starts trying to enjoy life again, meeting charming pilot Hoagie after having been a widow for some time. Mike & Jake encounter the Great White Shark on the water, and tag & track it for research. But the shark soon starts causing havoc, and comes after Thea on a banana boat ride! Now, Ellen, Mike, Jake & Hoagie will face the shark on his terms. Who will survive?